Katie Archibald first raced in what she calls a "proper" velodrome 14 months ago. On Tuesday, she will place her burgeoning track cycling medal collection in storage and head to Manchester to join British Cycling's illustrious academy programme. A cheerful, colourful character with brightly dyed hair, the 19-year-old from Milngavie, near Glasgow, is a one-off. Her route to the top must be unlike any other British cyclist's. Throughout her school years, her main sporting activity was swimming. In 2011, she took up grass-track cycling at Highland games and it wasn't until last September, after trying out the National Women's Omnium League around the UK's 400m concrete tracks earlier in 2012, that she decided to enter the Junior National Championships in Manchester. "That was the first time I was riding against people my own age on a proper velodrome. It all went very well [gold in individual pursuit, silver in the points race], so I thought, 'I'll take this a bit more seriously'," Archibald tells BBC Scotland. And therein lies the intriguing contrast between the young self-effacing woman who loves to laugh and the fierce competitor who can now call Olympians Laura Trott and Dani King team-mates. On the Highland Games grass-track circuit, 16-year-old Archibald would be given a head-start of three-quarters of a lap in some races over her male, 30-something competitors. "I was essentially training for pursuit on a big gear," she says. "I was chugging through the grass, not really doing a lot of bunch racing, just trying to make sure I wasn't caught." Archibald joined the City of Edinburgh Racing Club and learned the basics of track cycling on the Scottish capital's ageing, outdoor Meadowbank facility. Her first race on the omnium circuit involved eight hours of travel. Tracks at the likes of Dudley and Scunthorpe were her sporting domains. In the year or so since she made her debut at the Manchester Velodrome as a junior, Archibald has this year won two medals at the senior British Track Championships at the same venue, set a new record for the individual pursuit in winning Scottish Cycling's National Track Championships, won gold with Team GB and helped set a new world record in the team pursuit at the European Championships in the Netherlands. And, last weekend, she won silver and bronze at the World Cup event, again in Manchester. "It's a shock," she confesses. "My gran has a habit of sending through congratulations cards and I've been getting one a week. "For me, Manchester symbolises competition and big events and it has that world-class aura to it, because I've only been down there for nationals, the World Cup, revolutions and things. "I feel at home in Glasgow and know the track better, but something switches in my brain when I'm in Manchester that gives me a bit of an edge." At her most recent event, the World Cup, Archibald, representing Scottish Cycling's Braveheart trade team, won a silver medal in the scratch race, behind the 24-year-old Pole Malgorzata Wojtyra, and bronze in the individual pursuit, won by England's Joanna Rowsell. She could be forgiven for feeling a pang of regret, though, when her four team-mates, with whom she set the world record in the Netherlands - Rowsell, Laura Trott, Dani King and Elinor Barker - further lowered the record for the 4km pursuit. "It was almost inevitable the world record was going to go down again, but being able to compete against them, rather than with them, has been good for motivation and seeing where I need to be," she says. "It makes you hungry for it." As a newcomer to the elite track scene, Archibald is gradually becoming accustomed to mixing with some of London 2012's top British stars. "I don't get that first-time sensation of suddenly seeing what was once a telly face is now a face in the flesh," she says. "It's getting used to something that's still fantastic. "They still have all of their glory, all their brilliance, but they are more accessible." Archibald is packing up her possessions to move to England's north west for a new chapter in her blossoming career. British Cycling's Dave Brailsford and Shane Sutton will take a keen interest in her development. 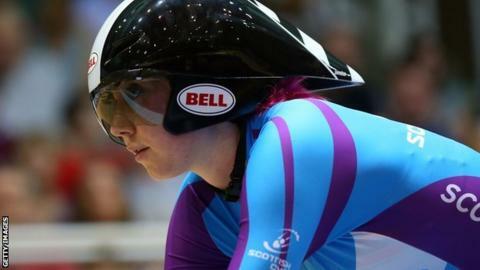 She admits she will miss the training sessions at the Sir Chris Hoy Velodrome with Charline Joiner, Eileen Roe and Kayleigh Brogan, who all hope to represent Scotland at the Commonwealth Games next summer. But, when asked about the move and feeling under pressure to maintain her ascent in the sport, she responds with a maturity beyond her years. "I keep looking up. I'm still in that position where there's a lot more to gain," she explains. "For the likes of Laura Trott, she has more pressure, she is probably more afraid of losing, whereas if I lose we say it's a development path. "Playing the underdog, you enter a race and, if you come last you say, 'OK, this is what I can take from it' and, if you come first, you think, 'ya beauty!'. "I haven't been to a local track league for a while. I think I'd feel more pressure in that." As well as representing Scottish Cycling's Braveheart trade team and Team GB, she will also ride on the roads as a member of Barney and Sarah Storey's Boot Out Breast Cancer team. Having sampled riding with Olympic gold medal winners, Archibald is keen for more. "I really want to be selected to ride team pursuit with the girls at one of the World Cup events," she adds. "I'm hoping to go to Mexico with them and then the biggest dream is the World Championships. Fingers crossed."